MAKE IT YOURS, MAKE IT THEIRS WITH TUNETOO. Buying gifts can be a very difficult task and something some of us dread, what do you get someone that seems to have everything? what do they even like? how do I show I put thought in this? But I bought them this before, how do I get them something original? If you find yourself asking these questions like I have on numerous occassions, I think TUNETOO could be the answer for you. Tunetoo reached out to me a little while ago and asked if I would like to check out their products and after having a look through their site and seeing what they offered, I jumped at the chance as I just loved the idea behind the brand. 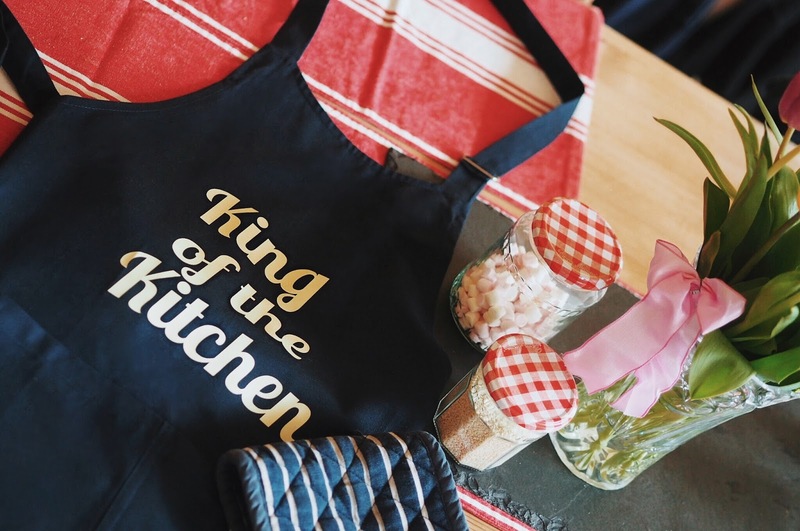 They offer a huge range of customisable items and this is why I was so impressed as I have seen customisable options with other brands before but never seen anything like the choice that TUNETOO offers. Seriously, you need to check out their site to see the variety of options and items they have available at your fingertips. The first item I decided to go with was this sweater, and can I just say, the quality of everything I received was unreal, I don't know about you but with these kind of things I am a bit apprehensive on the quality of the actual item but nope, not with Tunetoo, it even has that soft fleece like lining, making it super comfy. There's so much sweater styles to choose from, I went with 'sweatshirt crew neck unisex' incase your'e wondering. I got an XS but the style is quite oversized on me, in a sweater though I do like that fit. 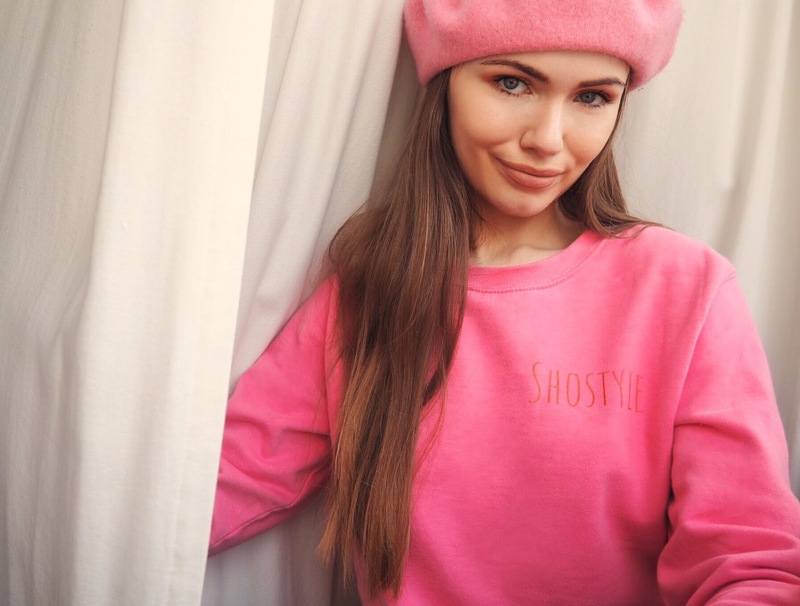 I couldn't resist adding 'SHOSTYLE' to this sweater for a bit of shameless self promo. They have pre made texts and logos but you can also choose your own so that's what I did, I went for one of my favourite colour themes, pink and red, of course. 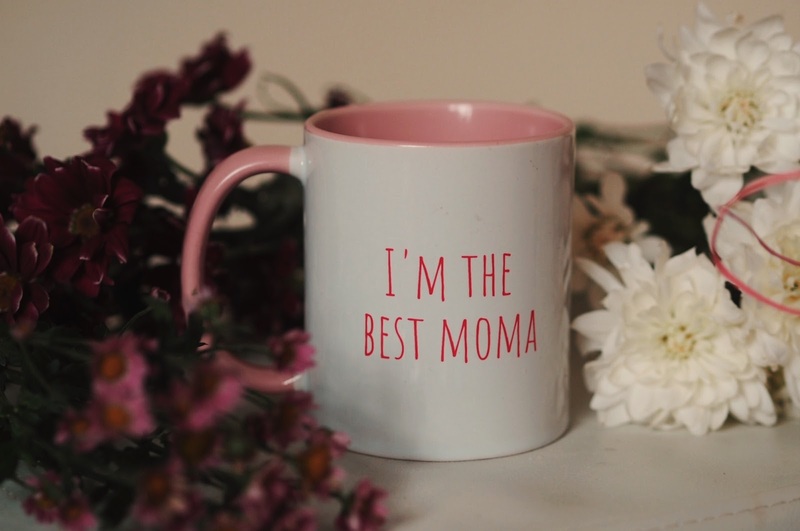 The next item I choose was this mug for my Mam as it was approaching Mother's Day when I was making my order. I chose the 'mug contrast rim' option and went for a gorgeous baby pink lining and handle. She love's being reminded that she's 'The Best Moma' while having her morning mug of tea. 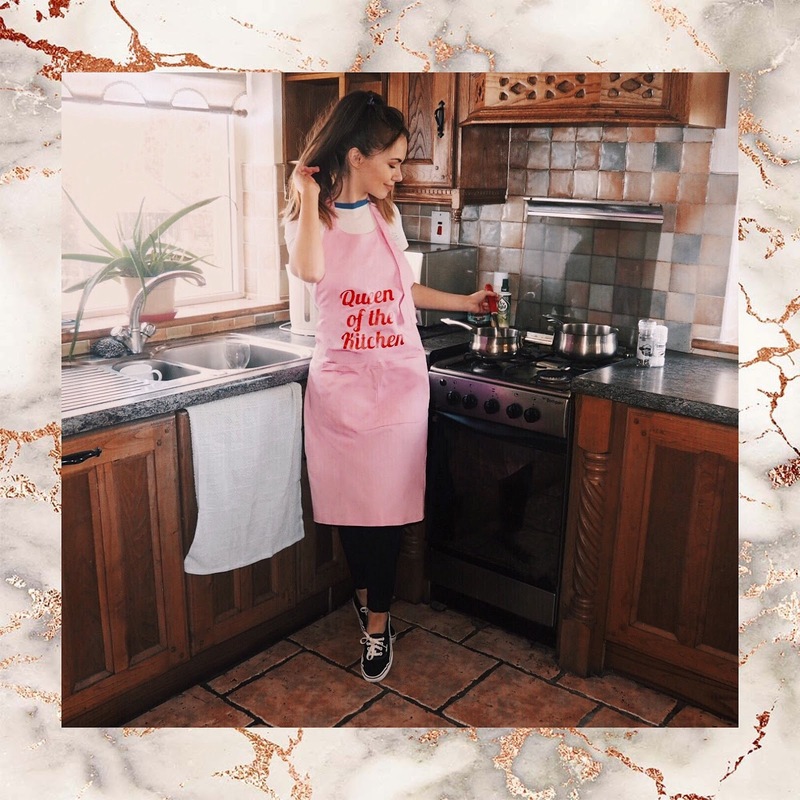 The final items I chose were these aprons as a bit of a cringey joke for my boyfriend and I but I also actually love them! 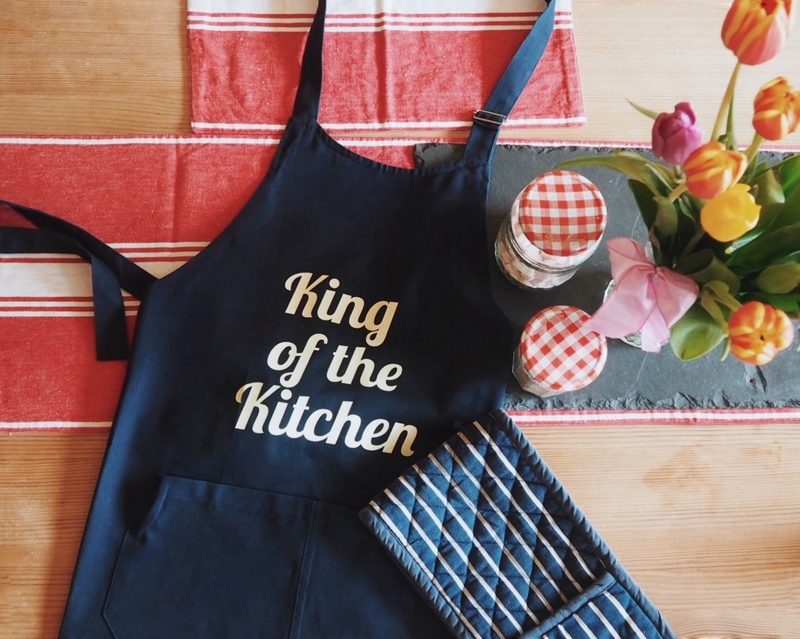 We both have said we wanted to improve on our skills in the kitchen and while he actually does have some culinary skills, I'm pretty terrible so I thought these might encourage us to start upping our cooking game. Again I went with my fave pink & red and I chose a navy & cream colour theme for his one. These are such great quality so will certainly last the test of time I feel. They are the 'garden or sommelier apron with pocket' if your'e looking to get them. TUNETOO have soooo many more options of items, styles etc. to personalise so definitely check them out if you're looking to get someone a thoughtful gift or of course a lil something for yourself either! I hope you liked this post and if you have any questions don't hesitate to ask! Definitely checking out the Tunetoo website! 8 THINGS TO DO/SEE IN BARCELONA. 5 THINGS I'D TELL MY TEENAGE SELF.